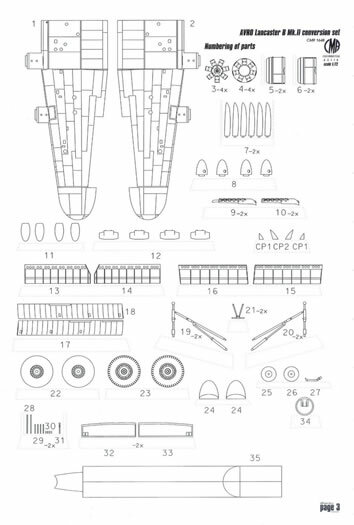 83 x resin airframe parts, 4 x clear resin wing- tip lights, 10 x black resin undercarriage parts, 1 x PE fret of 30 parts, and decals for 4 subjects. Available online from Hannants for £79.99, West Coast Hobbys for Cn$95.00, and various other CMR stockists. Bomb-bay doors cannot easily be displayed open. Excellent quality and detail. 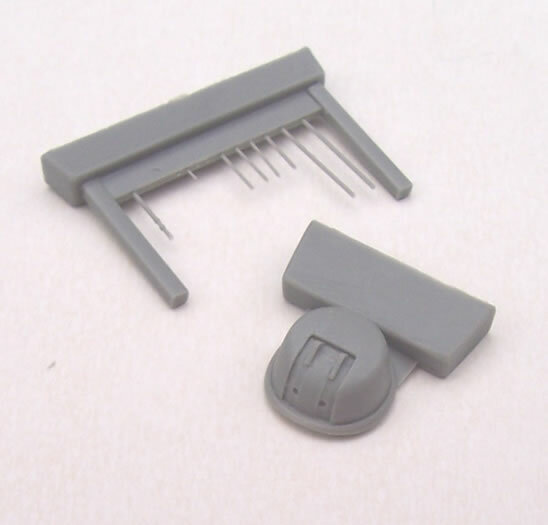 This is a very complete conversion suitable for use with Airfix, Hasegawa or Revell Lancaster kits. It only looks pricey until you add up the alternative costs to achieve the same results with multiple resin sets, PE, clear parts and decals. The economics are even better if you have a Lancaster fuselage left over from a York conversion. Derived from the problem-ridden Manchester, the ubiquitous Avro Lancaster really needs no introduction. It went on to be developed into the York, Lincoln, and Lancastrian, and influenced the design of the Shackleton. It is usually a Merlin-engined B MK I or III that springs to mind as the classic image of the Lancaster, rather than the radial Hercules-engined MK II. The MK II was developed in case a shortage of Merlin engines occurred. Compared to the Merlin-engined B MK I/III its operational ceiling was inferior and it had lower maximum bombload, both disadvantages. However the radial engines were less susceptible to battle damage than the in-line engines of the Mk I/III, and this led some crews to favour the MK II over the MK I/III. In the end only 301 MK II’s, including the prototype, were produced. Avro developed the prototype, but Armstrong-Whitworth manufactured all production MK II’s. The first 26 MK II’s had Bristol Hercules VI engines, whereas the remainder used Hercules XVI’s (and some early aircraft were retrofitted with these). There were also changes to the carburettor air intakes, with Beaufighter-style ones being adopted in 1943. All but the first few MK II’s had bulged bomb-bay doors to accommodate 8,000 lb bombs, and often had a periscope-sighted FN64 gun turret at the end of these, although this turret was largely ineffectual due to sighting limitations. It was often deleted saving 122 lbs in weight and the need for an eighth crewmember. The bulged doors and turret meant that H2S radar was not fitted to MK II’s. However G-H, a refinement of the GEE blind bombing and navigation system, was used with MK II’s. Initially fitted with an FN20 rear turret, many MK II’s were converted to use the similar but lighter FN120 which also had better sights. MK II’s seem to have the early shallow-style of bomb-aimer’s nose-blister, and early-style pitot mast. 60% of MK II’s were lost on operations, and towards the end of WW2 most remaining examples were serving in heavy conversion units. Declared obsolete at the war’s end, a few MK II’s served as special test airframes for a while, the last serving until 1950 with a Metrovick F2/4 jet engine fitted in its tail. 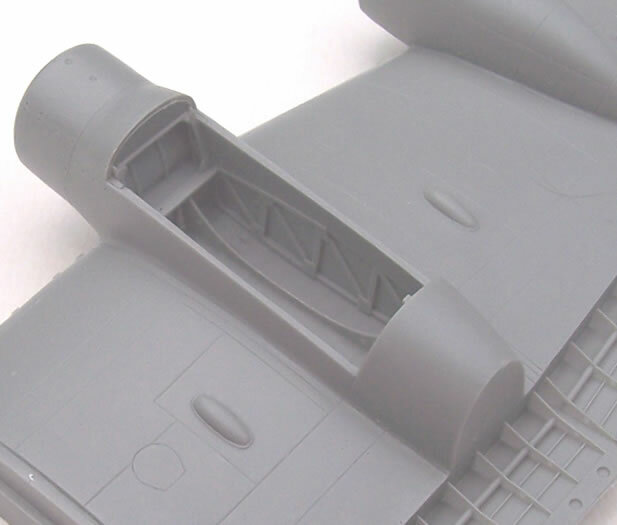 CMR is well know for its predominantly 1/72 resin and multi-media aircraft kits. 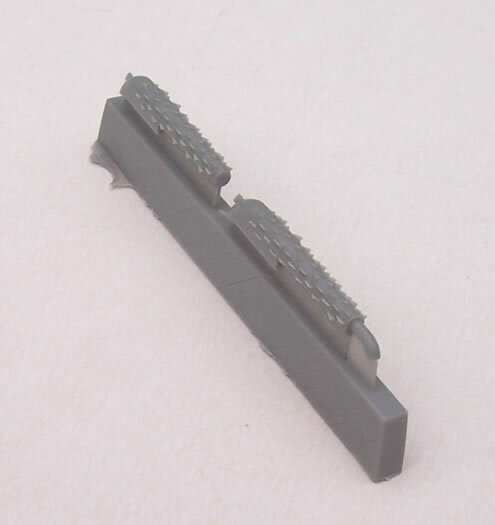 However it has produced a number of conversion sets as well. 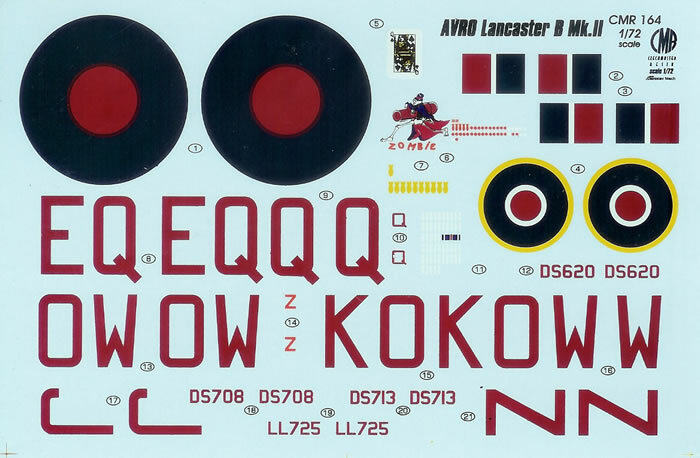 One of these was for the Avro York designed for use with the Airfix, Hasegawa and new Revell Kits (issued in two boxings: CMR-5136 & CMR-195). 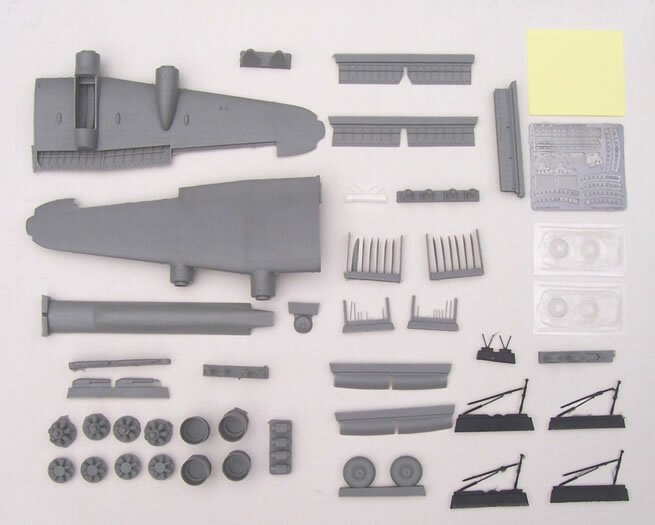 CMR figured anyone converting a Lancaster to a York would be left with sufficient Lancaster remnants to build a MK II if they were supplied with some wings, engines and undercarriage. CMR announced their Lancaster MK II conversion some time ago, and it was released at the recent IPMS UK Nationals, Scale Model World, at Telford. I’m aware of a previous Lancaster MK II conversion in resin by Paragon Designs which provided engines, cowls, exhausts, props and nacelles. The bulged bomb-bay doors and FN64 turret were offered in another set. No decals or early shallow-style bomb-aimer’s blister were provided. Aeroclub offered Hercules white-metal engines and low-pressure injected styrene cowls and nacelle fronts which provided the beginning of a MK II conversion, and the shallow-style blister and Rotol props were available as separate sets, but again no decals. The Paragon Design sets were clearly superior and also more expensive. 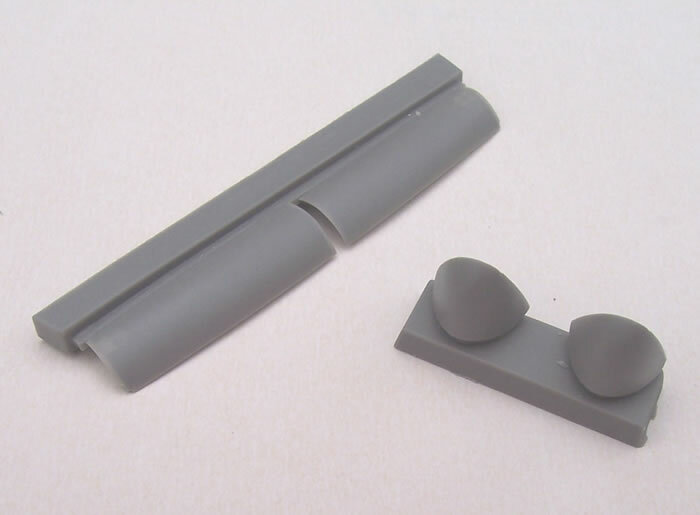 They also offered resin flaps, but again as a separate set. 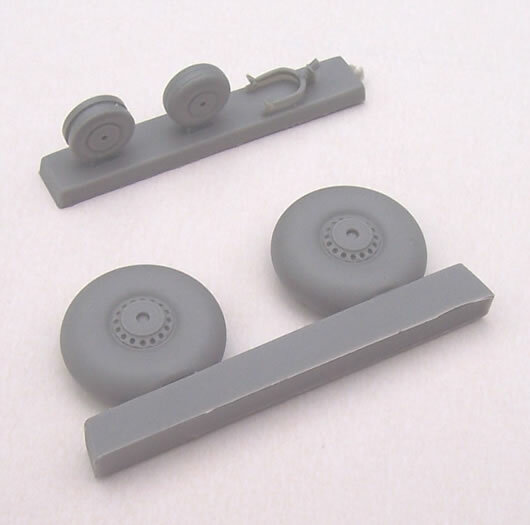 For many CMR’s complete and highly detailed conversion will be a welcome alternative. 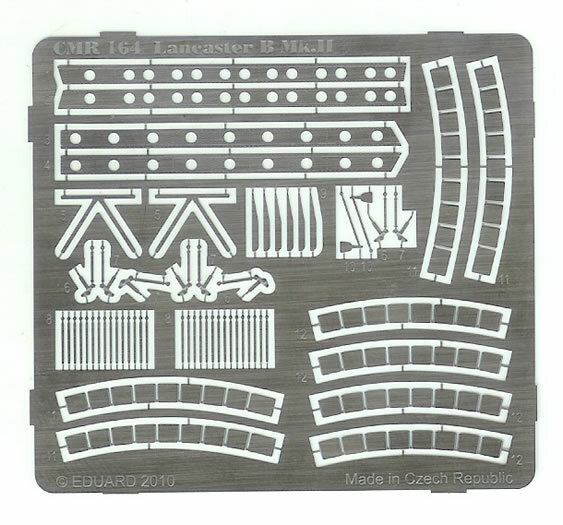 The set reviewed here is CMR-164B for the Hasegawa Lancaster BMK I/III kit, but it is the same as the other two except for the wing-root attachment area. It comes in a fairly large and sturdy top opening box. The parts are sealed in various plastic bags, a detailed parts map and several pages of well drawn diagrammatic instructions. There is also a two-page coloured paint and decaling guide. The parts are all produced to the highest standards, with only two tiny pinholes being evident in my example. The same high standards of production also apply to the clear parts, decals and Eduard PE fret. 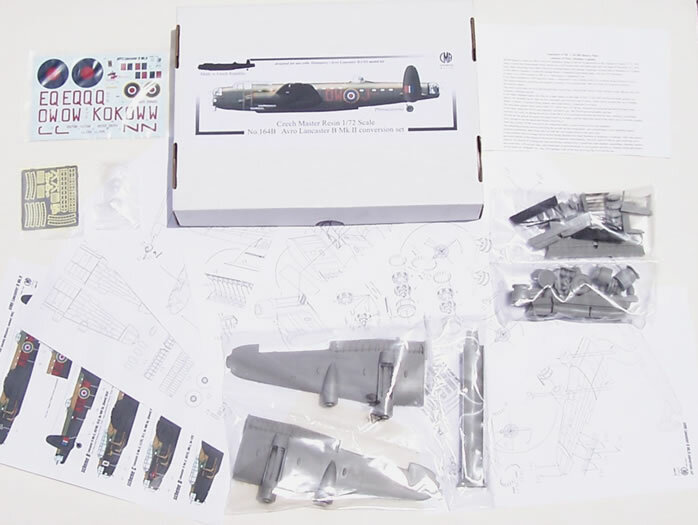 Where this set different from others is that it provides complete wings and a great deal more detail, plus the shallow bomb-aimer’s blister and decals. The wings provide very complete wheel well detail superior to any of the donor kits, along with separate flaps which are again highly detailed and include some PE parts. 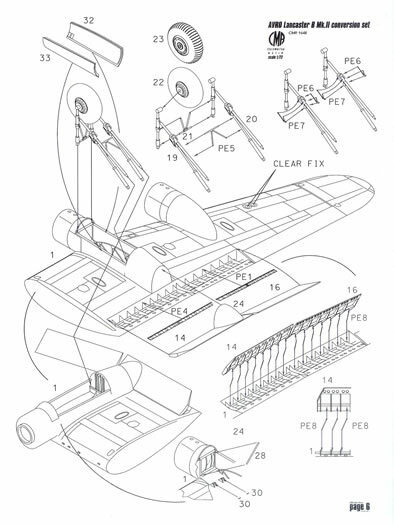 Separate ailerons with PE actuators and clear resin tip lights finish the wing package. The engines are nicely done, with separate oil cooler and carburettor air intakes. At first glance the cowls looked a little short, and then I realised that this is because they do not include the cowl flaps. 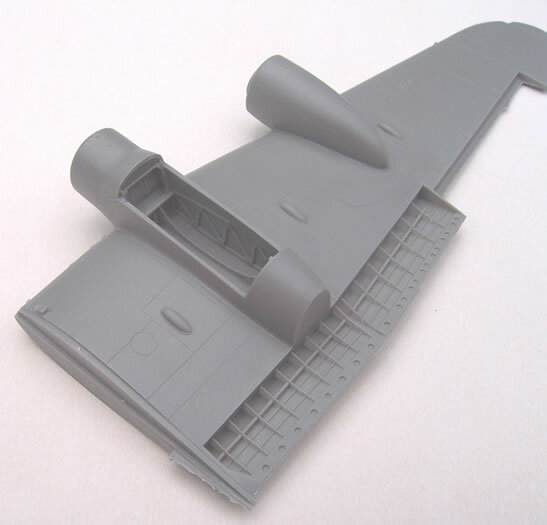 Instead the cowl flaps are provided with the PE fret, enabling a very realistic scale appearance to be achieved. The Rotol props have very fine scale blades. 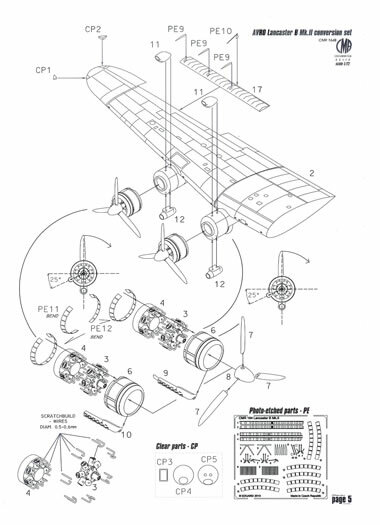 Remember that these rotated in the opposite direction to Merlin-engined Lancasters (as the instructions illustrate). 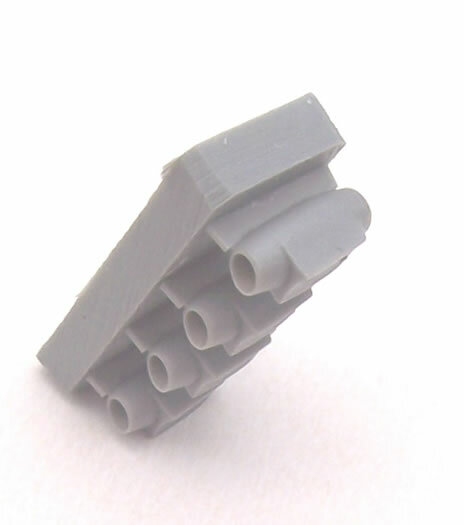 Very delicate and well-cast hedgehog exhausts complete the engine side of things. 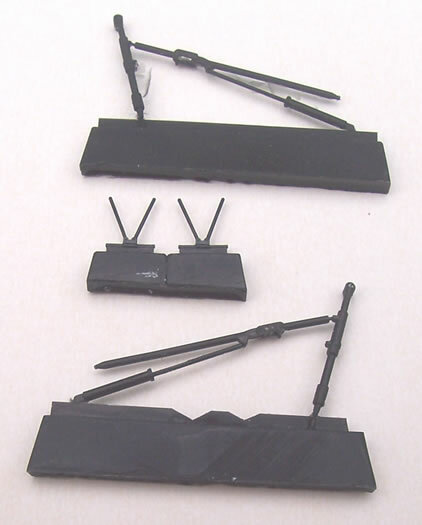 The main undercarriage legs are cast in a stronger black resin for weight bearing, and have some additional PE detail to be added. Smooth-tread main wheels and a choice of regular or anti shimmy tail-wheels are applied, along with the tail-wheel yoke. This aspect of the conversion is rounded out by undercarriage doors. 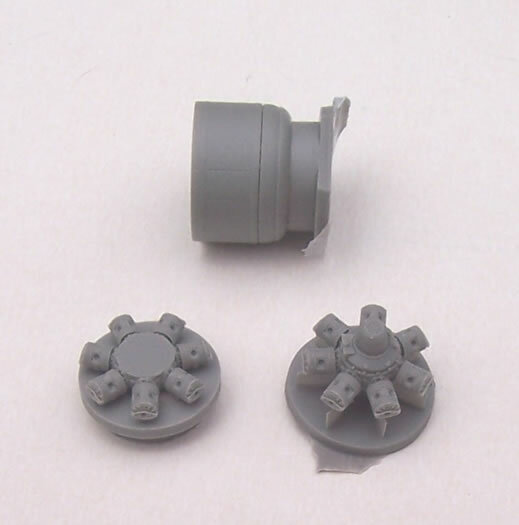 The bulged bomb-bay doors, so much a feature of most MK II’s, are provided as a one-piece casting. This part has been mastered by adding the bulge to the standard bomb-bay. If the doors are to be modelled open they will need to be separated from each other, cut away from the rear fairing, and the inside of the bulge will need to ground and scraped out, and any interior door detail added. The FN64 ventral turret and two gun barrels finish the underside. 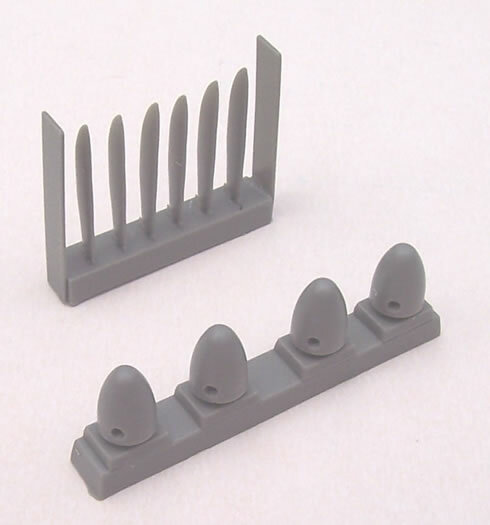 Two sets of clear parts are provided, allowing for practice or insurance depending on your point of view and approach to cutting vac-from canopies out. You have a choice of the early shallow or later and deeper bomb-aimer’s blister. Also supplied is the small rectangular window in the floor just behind the blister. 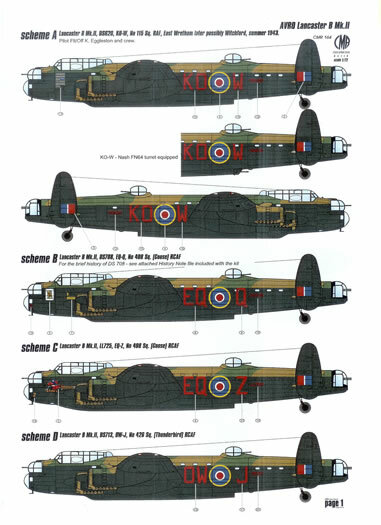 Four decal options are provided, two with nose-art and three have mission markings. The decals appear well printed in terms of registration and opacity. CMR has advised that there was a bit of a rush to get the first sets ready for release at Telford. This did not apply to the resin or any other parts, but to getting the instruction graphics finished in time. In the rush a couple of errors crept in. The first of these was the illustration of two pairs of main wheel options, one with smooth treaded tyres and the other with a ribbed tread. Of course only smooth tyres are applicable to WW2 Lancasters, and indeed only these are provided, but they should not have appeared in the instructions. The second error is the early instructions show exhaust pipes flowing from the cylinder heads towards the rear of the engines, rather than forwards towards the collector rings. This is because the graphics designer uses a Hercules MK 101 as a basis for the drawings rather than a Mk IV or XVI. The rush led to this error not being picked up. CMR has corrected the errors on all instructions following the first few production examples. 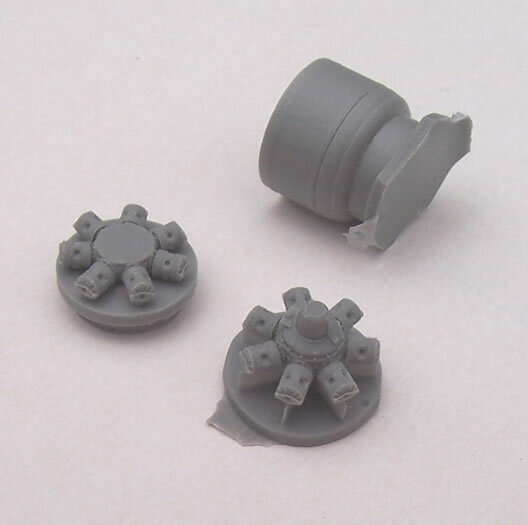 After a quick tally up I make this list about 70-80% of the price of the CMR set, and if you are using the leftovers from a York conversion you would still need undercarriage legs. This is a superbly executed conversion set with high levels of detail, yet it looks to be a fairly simple use. A few may regret the bomb-doors not being suitable for display open. Offering three versions of the conversion set to suit the main brand choices of donor kit is commendable. All three donors have their pros and cons, and so allow the builder a choice of kit style and budget. 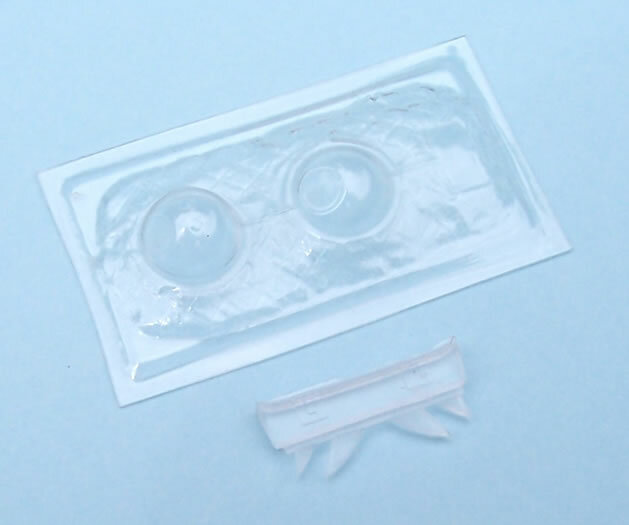 Just remember to order the right conversion set for the donor kit you are using. Yes, if you are simply converting a Lancaster B Mk I/III to a Mk II without any extra detail you could do things a bit cheaper. But you get a lot for the price if extra detail is your thing, and the economics look even better if you have a fuselage and tail left over from a York conversion because you won’t have to buy a donor kit.